Please read my first 5 or 6 posts after this one and then if you have ? ask. This is not a very complicated application. It is like a teaching tool so new people can learn the structure and layout of Windows Unattending. Most can click on the text next to a checkbox and it will explain what it's going to do. I structured it this way where you click one item at a time and complete them step's before allowing it to move on. Thing's have to be done correctly in order for you to create a sucessful Installation DVD. This will work for those know nothing of Unattended setups. You can use the basics from this or refer to other posts here in this forum or the Unattended Vista forum to find answers. I know that may be annoying to veteran unattenders but let's help the new people. Working now with 64 bit images. USE SAMPLE XML first try of this. I don't have all settings and you can mod it after. Let me know if I need to add something!!! Does not use the WAIK if installed or Windows directories unless you don't have waik or Win 7 then it only copies a few files. Do a favor and let people download the latest. will copy the Panther folder so you can figure out whats going on. Causes a major crash with an xml in Win 7. You get an ugly little box and thats it, you're history. 1 mistake in an xml will take you down. APPS folder should be on the root of any drive. 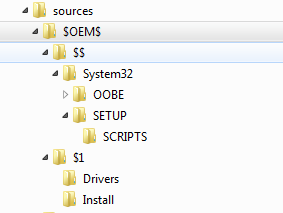 That way the Se7en_UA will see it regardless of where its installed or what drive APPS is on. REG ADD %KEY%\iAdd /V Inum /D "CMD /C REG DELETE \"HKLM\SOFTWARE\Microsoft\Windows\CurrentVersion\Uninstall\MozillaMaintenanceService\" /f" /f"
select the folder when you add Applications, thats it. ALL your current settings and bookmarks are included. copies registry entries from your current registry. The program needs to be Installed when this is done. BUT If you copy once then it saves it to the [APPS] folder and any future Installs will use that. If you have it installed then it overwrites the current file = SWEET HUH? Copy any File from anywhere to be placed in same directory on Target computer. All of them, it keeps everything up to date. If yesterday/last month I used this and copied say a Folder with a FLAG3 entry and today I wake up and realize it's changed so I copy again at the APP Installer. If it exists Installed then it delete's from your APPS Folder and the APPS folder from dvd sources and re-writes everything. Otherwise it uses what I had done last time I copied it in. I've been copying my Firefox and Thunderbird and many more for year's with same methods. Just drop new Fox or whatever in same APPS folder. My Settings, My files, My folders, My Registry, SERIAL NUMBERS all up to date. hi, ne chance of that .cmd to remove C:\zMountDir? try everything just cant get rid of it! I only get that if I uninstall and try to copy back too fast, darn Seven locks the folders down. So this is, in the principle, similiar utility as vLite? can you explain where at? also if you haven't gone very far you can reinstall right over the top of it, or uninstall and try again. 1. install program - fine. 2. open program 1st time - fine. after this the program exits by default, reopening the program gives the run time error. reinstalling goes back to 1. You need to unpack the win7.iso to a folder or copy from the dvd.